Originally an elevated freight rail line connecting through warehouses and factories along its route, the High Line, now an artfully repurposed public park, has become one of NYC’s most beloved and popular respites. One look and you too, will see why this park is such a must-see destination for tourists visiting the Big Apple! The High Line is 1.45 miles in length, and extends from Gansevoort Street in the Meatpacking District, to 34th Streetin the Hell’s Kitchen neighborhood, where it terminates at the Hudson Yards. Worth noting is the fact that the elevated park runs through West Chelsea, widely known for literally, hundreds of Manhattan’s art galleries. The High Line, suspended 30 feet above the bustling city streets below, winds its way through several neighborhoods; each one with its own distinct character. Throughout these neighborhoods you’ll find wonderful eclectic art collections, sumptuous cuisine and a plethora of social activities. Opened in 1934 as part of the West Side Improvement Project, the High Line was originally built as a means to safely and efficiently transport goods to and from the largest industrial and manufacturing district in Manhattan, by way of an elevated rail system. Many warehouses that hugged the rail line were designed with huge building cutouts that accommodated the passage of freight trains, allowing for easy access for the pick-up and delivery of transported goods. Progress during the 1950’s-1960’s introduced better, more efficient ways for freight delivery. No longer deemed necessary, huge sections of the former rail were demolished. With intent to remove the remaining sections, the last freight train rolled along the High Line, in 1980. Over the next 17 years, the High Line would become an abandoned oasis of self-sown vegetation as plans to demolish it loomed and a fierce struggle to save and repurpose it would begin. In 1999, local area residents, Joshua David and Robert Hammond, joined forces to create the Friends of the High Line, an organization that would push for the preservation of the rail line with the idea to make use of it as a public space. The former rail would be repurposed in stages. The first of three completed sections of NYC’s High Line “Park-in-the-Sky”, opened in 2009, followed by the second and third sections, opening in 2011 and 2014, respectively. 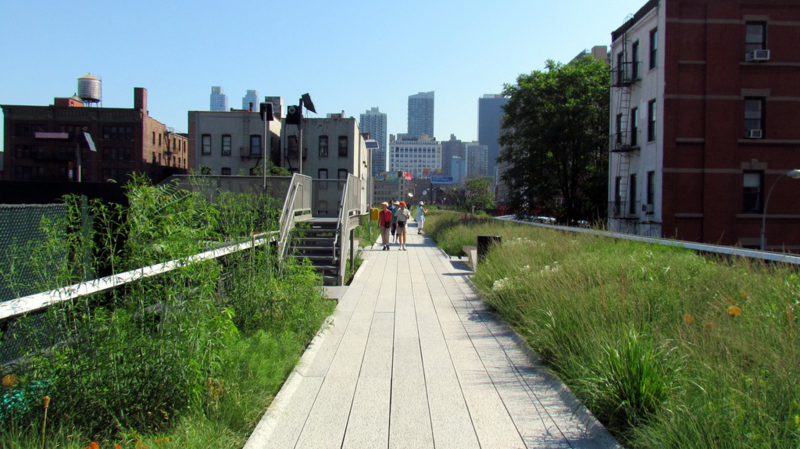 After a long and well-fought battle, the endeavors of Joshua David, Robert Hammond and members of the Friends of the High Line organization, had finally paid off; the result was a spectacular elevated, linear park for all to enjoy! Today, this innovative, unexpected and vastly popular tourist attraction, is as much a treat for locals as it is with visitors seeking to explore the splendor of this amazing greenway. The ‘Park in the Sky’ lives up to its name. A meticulously curated collection of trees and perennials serve as a natural respite, in the midst of a distinctly urban landscape. The plantings are made to look as if they grow somewhat random and untamed—a sort of organized wilderness that calls to mind the landscape of old abandoned tracks that succumbed to a takeover by nature. It is as if the plants have taken root through the intricate planning of nature, rather than the skilled mastery of Piet Oudolf, a Netherlands-based horticulturist. 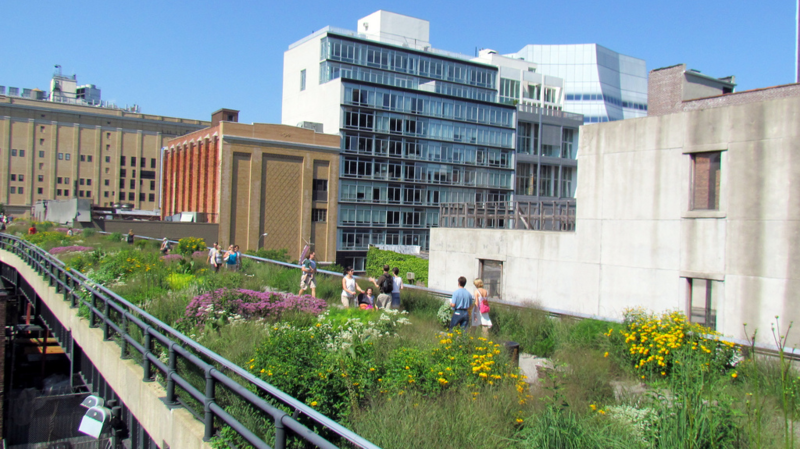 Using the pre-existing plant communities once present upon the High Line as inspiration, more than 500 species of vegetation currently grow within the current landscape, carefully selected and placed to create an ecosystem that is well-adapted, drought-tolerant, and low-maintenance. This purposefully wild landscape is a big part of what makes the High Line so very appealing—a curious juxtaposition of urban and natural settings, co-existing artfully in their elevated home—a ‘Park in the Sky’, indeed! Real estate development has flourished in recent years and views from atop the High Line showcase many of NYC’s architectural advancements. Visitors fancying high-end architecture will undoubtedly be awestruck by views of such innovative, modern buildings as the spectacular IAC building at West 18 Street, designed by “starchitect” Frank Gehry, and the ‘Vision Machine” building at West 19 Street designed by Jean Nouvel. Look in one direction and you can spot the Empire State Building in the distance, while the other puts the Statue of Liberty on display. 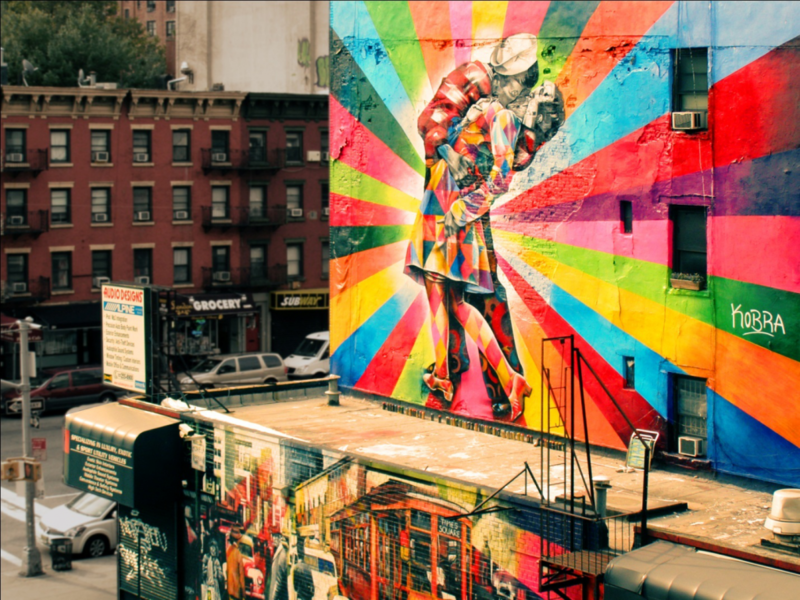 Surrounding one part of the High Line is the neighborhood of West Chelsea, well-known by locals for its hundreds of art galleries. It’s no wonder that the High Line itself, has essentially become a hub for both public art and art installations. Visitors to the park will come across many commissioned art installations, some temporary and others permanent. The linear park is the perfect medium for the expression of contemporary art. You’ll see artistic expressions displayed not only ON the High Line but occasionally visible in the window of an nearby residence or business, on rooftop water tanks, on the streets below, and on the sides of buildings as you venture along the greenway. The High Line Plinth is a recent development scheduled to open in 2018, and it will serve as a landmark destination on the High Line, for public international art commissions. Located upon the High Line spur at W. 30th Street and 10th Avenue, this plinth is expected to have its formal opening sometime this year on what will be the fourth and final section to complete the High Line. At West 30th Street, you’ll find the Perishing Square Beams, an eccentric play area for kids. Here, children can safely play upon the original steel beam and girder framework of the rail line, safety coated with silicone. Below the beams aresunken areas where kids can crawl around, play, have fun! 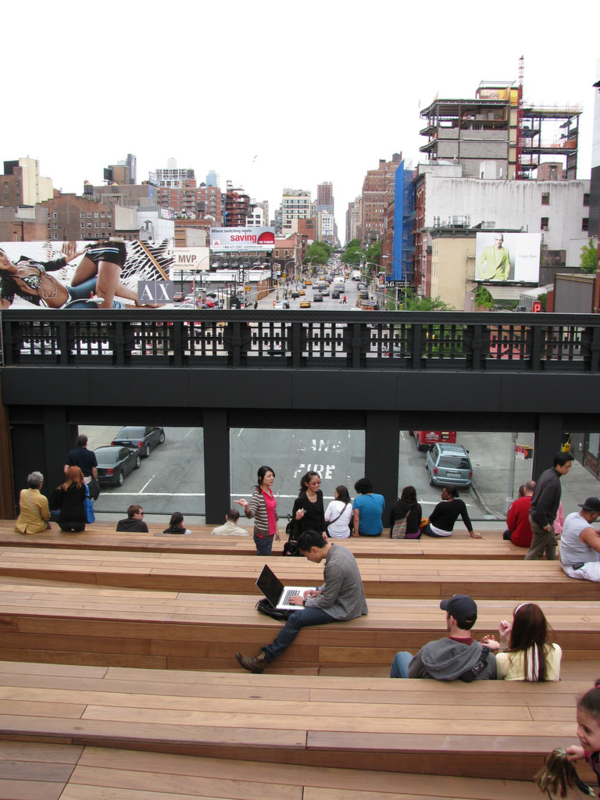 Located on the High Line at West 17th Street, the 10th Avenue Square Sunken Overlook is a simplistic design offering an amphitheater-like space where individuals can take a seat and look out over the avenue. Prior to the creation of the High Line in 1934, the avenue below, was once referred to as “Death Avenue” due to the many tragic accidents occurring between ground level freight trains and pedestrians. Today, this overlook is a terrific place to relax, chat with friends and family, enjoy an occasional Shakespearean performance or simply drink in the views of the bustling city below. The High Line park is truly an incredible combination of innovation and beauty! This article is just the tip of the iceberg. Want to learn more about this garden wonderland and it’s surrounding neighborhoods? Walk the High Line with My NY Tours, your best source for getting the full, immersive experience of not only the ‘Park in the Sky’ but some of the popular area hotspots such as the Meatpacking District and nearby Chelsea Market. Uncover the Secrets of the High Line with our licensed and local tour guides who can give you the nitty gritty on this extraordinary linear park and the districts it runs through. 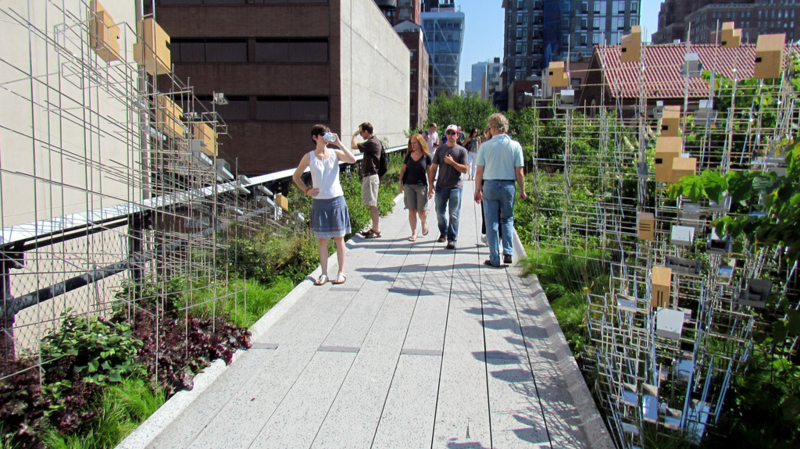 Don’t hesitate—book the absolute best High Line Tour now!